Yes, I make Harry Potter figurines. Yay. 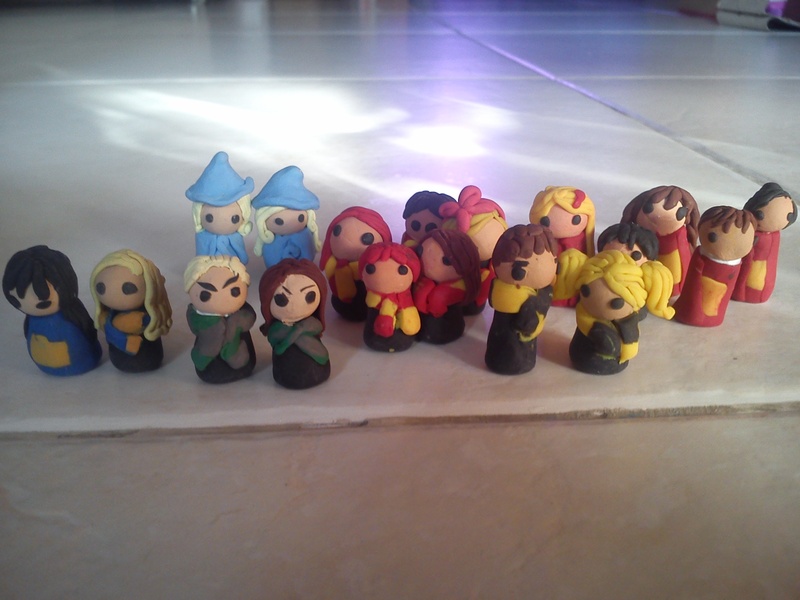 My sister made the Gryffindors and the Hufflepuffs, plus Gabrielle Delacour. I did the rest. Characters as follow, from left to right. Back Row: Fleur Delacour (Beauxbatons Triwizard Champion), Gabrielle Delacour (Beauxbatons, Fleur’s younger sister), Ginny Weasley (Grryffindor), Neville Longbottom (Gryffindor), Lavender Brown (Gryffindor), Katie Bell (Gryffindor Chaser), Alicia Spinnet (Gryffindor Chaser), Oliver Wood (Gryffindor Quidditch Captain, Keeper), Angelina Johnson (Gryffindor Chaser). Front Row: Cho Chang (Ravenclaw Seeker [seriously I don’t get why it’s Chang Cho for Merlin’s sake]), Luna Lovegood (Ravenclaw), DRACO FRIGGIN MALFOY (Slytherin Seeker~~~~~~~~), Pansy Parkinson (Slytherin XDD), Cedric Diggory (Hufflepuff, Hogwarts Triwizard Champion), Hannah Abbott (Hufflepuff). #minipotterverse – don’t try to find me on Instagram. Or Twitter. Because I don’t have either of those. This entry was tagged Beauxbatons, Book, chibi, cute, Draco Malfoy, fanart, fandom, Fleur delacour, Ginny Weasley, Golden Trio, gryffindor, Harry Potter, Hermione Granger, hogwarts, hufflepuff, kawaii, Pigfarts, ravenclaw, slytherin, Triwizard. Bookmark the permalink.